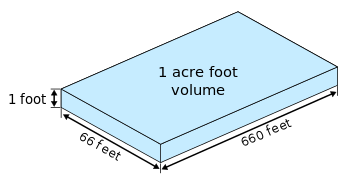 As the name suggests, an acre-foot is defined as the volume of one acre of surface area to a depth of one foot. Since an acre is defined as a chain by a furlong (i.e. 66 ft × 660 ft or 20.12 m × 201.17 m), an acre-foot is 43,560 cubic feet (1,233 m3). There are two definitions of an acre-foot (differing by about 0.0006%), depending on whether the "foot" used is an "international foot" or a "U.S. survey foot". As a rule of thumb in U.S. water management, one acre-foot is taken to be the planned water usage of a suburban family household, annually. In some areas of the desert Southwest, where water conservation is followed and often enforced, a typical family uses only about 0.25 acre-foot of water per year. One acre-foot/year is approximately 893 gallons (3.38 m3) per day. The acre-foot (or more specifically the time rate unit of acre-foot per year) has been used historically in the U.S. in many water-management agreements, for example the Colorado River Compact, which divides 15 million acre-feet (MAF) per year (586 m3/s) among seven western U.S. states. Water reservoir capacities in the U.S. are commonly given in thousands of acre-feet, abbreviated TAF. Elsewhere in the world, where the metric system is in common use, water volumes can be expressed in either cubic metres (as in flow rates of cubic metres/second, or "cumecs") or, for water usage, storage or irrigation volumes, in kilolitres (kL = 1 cubic metre), megalitres (ML = 1,000 cubic metres), or gigalitres (GL = 1,000,000 cubic metres). One acre-foot is approximately equivalent to 1.233 megalitres and 1,233 kilolitres. Large bodies of water may be measured in cubic kilometres (1,000,000,000 m3, or 1000 GL), with 1000 TAF or 1 million acre-feet approximately equalling 1.233 km3. ^ This conversion assumes the international foot is used to define the U.S. gallon and the U.S. survey foot to define the acre foot. If the same foot is used for both, the result is the ​325,851 3⁄7 U.S. gal figure as obtained previously. ^ "NM OSE Glossary". Archived from the original on 14 November 2005. Retrieved 15 March 2014. ^ The state of Montana assumes 1.0 acre-foot per year for a family of five. See Water Rights Bureau; state of Montana (April 13, 2004). "Form No. 627 R8/03 Notice of Water Right" (PDF). Archived from the original (PDF) on 2008-01-25. Retrieved 2008-01-30. This page was last edited on 1 October 2018, at 16:34 (UTC).